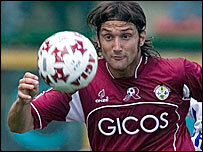 Manchester City have completed the signing of Reggina's Rolando Bianchi. The 24-year-old former Italy Under-21 international striker had a medical at the club's Carrington training ground before completing formalities. Reggina say the fee will be £8.8m, and the Italian becomes Sven-Goran Eriksson's first signing for City. Eriksson said: "He scored nearly 20 goals last season in Serie A, which is a lot of goals in such a difficult league. It's a good record." He added: "He's young, and I think it's a very important signing because he should have a great future. He's a good footballer as well as a good goal scorer, which is what we need. "He's very hard working, very strong and he can score - if you can score nearly 20 goals in Serie A and you are not with one of the top clubs like Milan or Juve then you must be talented. "The signing's good because the club has been working very hard, and there will be some more to come in for sure. "I hope that the fans will be happy with this first signing, and the rest as well. Then it's up to the player, but I'm very optimistic about Rolando." Bianchi, who scored 18 goals in Serie A last season, could play in City's friendly at Doncaster on Saturday. Eriksson is understood to have a substantial budget to revamp the City squad after they struggled last season under former boss Stuart Pearce. And Bianchi said the City manager's personal touch had persuaded him a move to England was right for him. "Mr Eriksson called me personally and told me he wanted me at any cost," revealed Bianchi. "He told me 'Come and we will be watched by 50,000 fans every Saturday and we want to be in Europe'. "When he just mentioned the word Europe, I had a big feeling." City finished 14th and one of the main problems was in attack as they failed to score any Premier League goals at their Eastlands home from 1 January until the end of the season. The club have lost key players in central defender Sylvain Distin and midfielder Joey Barton during the summer and Eriksson will also have to replace them as well as strengthening his squad.